BROWNSBURG, Ind. 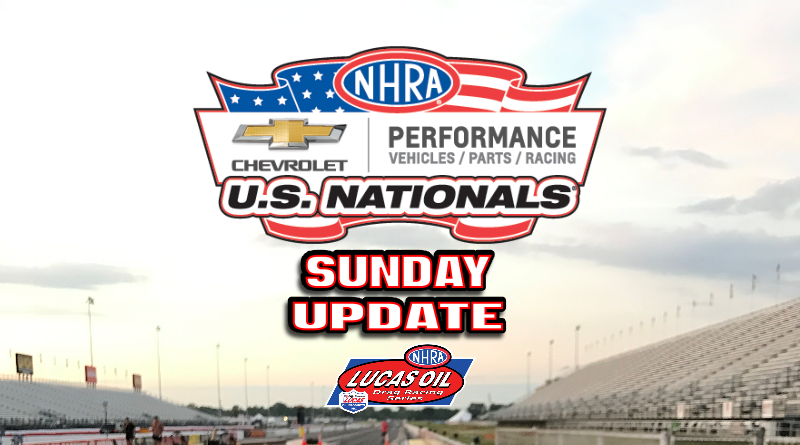 – Day 5 at the U.S. Nationals saw sportsman competitors race down to the final four competitions in each class with the exception of the Factory Stock Showdown which still has eight cars remaining for Monday’s final eliminations. Those remaining in competition are in for a special day as Monday at INDY is one of the coolest things ever. The intensity amps up, racer’s nerves are racing, and the thought of being an INDY champion is almost overwhelming. Racers must push aside all of these things and focus on finding two more win lights to add their name to the history books. The top story from the day included Joseph Welch’s disqualification after his first round victory due to a throttle body violation. This was the second run-in Welch had with the NHRA tech officials this week as his first qualifying pass, the first sub 8-second run in FSS history, was thrown out after an adjustable suspension part was found. The other big story from Sunday was Joey Shipp. The Indianapolis native has two shots remaining to earn the coveted INDY Wally as he is still alive in Super Gas and Stock Eliminator classes. What a great run by Shipp as he’s outlasted hundreds of competitors to make it to Monday in two classes. An INDY double would be special for sure. After one round of competition, the FSS group is down to eight cars remaining. As mentioned above Joseph Welch took out #2 qualifier Mark Pawuk after Pawuk smoked the tires off the line but was ultimately disqualified for a throttle body violation. This give DSR two opportunities to collect the INDY championship. First round winners include: Geoff Turk, Stephen Bell, Leah Prichett, Chris Holbrook, Arthur Kohn, Leonard Libersher, Kevin Skinner, and Pawuk. Super Stock was the last of the sportsman classes to start eliminations as first round kicked off on Sunday morning. The Super Stock racers endured five rounds of eliminations on Sunday as they narrowed the 128-car field down to the final four competitors. The final four are highlighted below. Dale Hulquist, Crosby, Tex., drove his GT/MA ’98 Firebird to the semifinal round by defeating a red-lighting Jeff Gilman in round 5. Hulquist defeated several tough Division 4 runners in prior rounds including Terry Emmons, Brett Candies, and J. Allen Sherman. David Barton, last year’s Factory Stock Showdown season champ, earned his spot in Monday’s semifinal round after defeating sportsman great David Rampy on a holeshot in round 5. Jeffery Myers, Decatur, Ind., drove his FSS/E ’15 Camaro to the semifinal round by defeating Chris Cour in round 5. Both drivers laid down .00 reactions but it was Myers taking the win after Cour took .029 stripe to go under by -.010. Myers .013 over 9.193 moved him into round 6. In earlier rounds, Myers defeating veteran racers Zach Running and Gary Stinnett. Dennis Steward, Port Orange, Fla., claimed the fourth spot in the Super Stock semifinal round after turning back a red-lighting Venice Perno in round 5. Steward also defeated former U.S. Nationals winner Larry Hodge in round 4 of competition. The semifinal pairings are as follows: Steward against Barton and Hulquist against Myers. As for the Super Stock picks I made in my event preview post, I’m dead in the water in Super Stock as none of my picks came close as Jimmy DeFrank, Jacob Pitt, Gary Stinnett, Ray Skillman, and Jeff Strickland all bowed out in the early rounds on Sunday. The Stockers made two rounds on Sunday as they opened the day with round 4 in the morning and helped close the day with round 5 late in the evening to narrow the field to just four competitors. The final four are highlighted below. Larry Hill, Hickory, Ky., B/SA ’70 Plymouth to the semifinals after defeating a red-lighting Brett Candies in round 5. In earlier rounds, Hill defeated Jeremy Duncan, Ken Meile, Bill Dyer, and Chad Loge. Jerry Emmons, Pasadena, Tex., drove his B/SA ’69 Camaro to the semifinals after defeating a red-lighting Larry Gilley in round 5. Gilley, the defending INDY champ, looked to have had problems on the line as he was -.333 red. Emmons, #9 in the world last year, had been solid at the tree and close to his dial throughout the first five rounds of eliminations. T.C. Morris, New Haven, Ky., drove his ’04 Pontiac GTO to the semifinal round after defeating Division 7 racer Brent Calvert in round 5. Morris used a .026 to .087 holeshot to take the victory after both drivers ran .02 above their dial-in. Morris defeated Andrew Hill and Todd Hoven in earlier rounds. Joey Shipp, Indianapolis, Ind., cut a perfect .000 reaction time in round 5 to defeat Bryan Merkle and move into the semi’s. Shipp also defeated Jeff Lopez, Donnie Beeler, Doug Duell, and Marion Stephenson in the first four rounds. We will have a heads-up no-breakout B/SA matchup in the semi’s as Hill and Emmons are set to do battle. Hill has about a tenth advantage based on qualifying but I’m sure the Emmons clan will find some E.T. for this matchup. Shipp will take on Morris in the other half of the semifinal round. My Stock Eliminator picks were much better than Super Stock but I eventually lost out as Brad Plourd, Lee Zane, and Jeff Lopez all lost in round 4. The Super Comp competitors had just one round of eliminations for the second day in a row as they completed round 5 early in the morning and was done for the rest of the day. This is why the U.S. Nationals is considered a marathon as you typically only see the track once in a 24-hour period. With all that waiting you have to manage your focus, your nerves, and your emotions so you’re ready at a moments notice. Joe Hessling, Toledo, Ohio, continued his strong run after defeating yet another top racer, Devin Isenhower, in round 5. Hessling and Isenhower put on a great race as both were .00 at the tree and 8.91 at the stripe. Hessling’s .017 package narrowly turned away Isenhower’s .021 package. In previous rounds, Hessling defeated Koy Collier, Steve Hoyt, Rob Kropfeld, and Michelle Furr. In another great race, former INDY winner and World Champ, Gary Stinnett defeated Rick Hughes. Hughes laid down .014 total but lost by .004 to Stinnett’s 10-pack. The .00 to .00, 8.90 to 8.90 race was the highlight of the round. Nichole Stephenson, Hillsboro, Ind., took an easy win over the door-car of Scott Vandewalker after he had problems on the line posting a .162 reaction time. Stephenson used a .026, 8.949 to claim her spot in the final four. We will have a door-car in the semifinals of Super Comp as Steve Eckerd drove his ’91 Cutlass to the red-light win over Tim Marsh in round 5. Eckerd has been solid throughout eliminations as he defeated notable racers Troy Stone, Alan Kenney, and Ray Miller Jr. in earlier rounds. In the semifinals, Eckerd will matchup against Hessling and Stinnett will meet Stephenson. With Isenhower out, all of my pre-event picks have now been defeated and based on experience, I’d have to say Stinnett is the favorite to capture another INDY Wally. Everything I said above about Super Comp can be inserted here as Super Gas only had one hit for the day. Charlie Kenopic, Renfrew, Ontario, drove his ’63 Corvette roadster to the round 5 win using a perfect light to defeat John Sikish in a double-breakout decision. Kenopic, the winner earlier this year at Virginia, would love to add another national event Wally to his mantle. Steve Hoyt, Fort Wayne, Ind., drove his ’63 Corvette roadster to victory over Jeff Reed in a double-breakout race. After even lights, Hoyt picked up the win after his 9.892 was better than Reed’s 9.865. Hoyt has to be the favorite to win as he’s has consistently laid down exceptional laps round after round. Joey Shipp has a shot to double up as he is still alive in Stock Eliminator and Super Gas. In one of the best rounds in Super Gas, Shipp defeated Kevin Moore by .003 after both drivers posted 9.90 laps in round 5. Shipp’s .016, 9.906 just outpaced Moore’s .017, 9.908. What a great race! Shipp is looking strong as he’s posted 9.90 E.T.s in four of the first five rounds. He’s also defeated several top named drivers including Iggie Boicesco, Steve Williams, and Justin Lopes. Although he’s no longer alive for the double, Devin Isenhower’s INDY dreams are still alive in Super Gas. After losing a close Super Comp race in round 5, Isenhower, Lebanon, Ind., rolled back around and squared off with Division 4 hitter Jackson Collier. Isenhower used a .005 to .014 reaction time advantage to post the win after both drivers ran 9.92 E.T.s. In the semi’s, Isenhower will face Kenopic and Hoyt will face Shipp. After Kevin Moore fell in round 5, I am left with one shot to win as Isenhower was one of my top 5 picks in my event preview article last week. We’ll see if he can win it all. We’ll post Monday’s final round results as they are available.